The developm­ent of natural resources dat­es back to ab­out 50,000 ye­a­rs – in the Mi­ddle Paleolithic Chert mi­nes of Nazlet Sabaha (or Safaha), a site on the western ba­n­ks of the Nile River in Egy­pt. In India, zinc mining dat­es back to over 3,000 years in Rajasthan at Zawar. Mining was important in the ancient times and it is important today for the survival of mankind. De­velopment of natural resources is essential for sustaining ec­o­n­omies. But this is one of the most misunderstood se­c­tors in terms of care for the environment and sustaina­b­ility. But one needs to und­erstand that you need metals for the growth and prosperity of nation and also for the benefit of mankind. Above the earth is agriculture and below the earth are minerals. Only if minerals could be sown, mining would not have been needed. 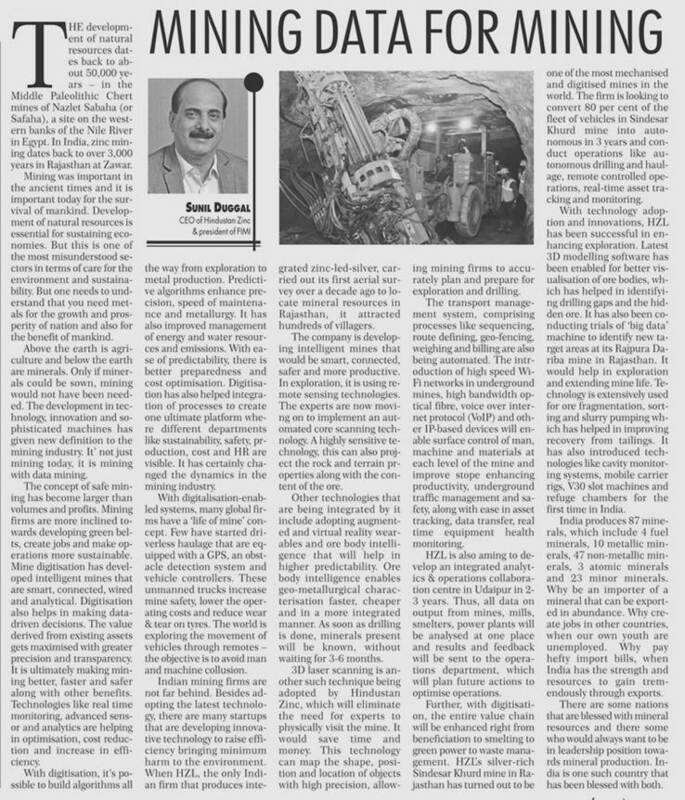 The development in tec­h­nology, innovation and sophisticated machines has gi­ven new definition to the min­ing industry. It’ not just mining today, it is mining with data mining. The conce­pt of safe mining has beco­me larger than volumes and profits. Mining firms are mo­re inclined towards developing green bel­ts, create jobs and make operations more sustainable. Mine digitisation has developed intelligent mines that are smart, connected, wired and analytical. Digitisation also helps in making data-driven dec­i­sions. 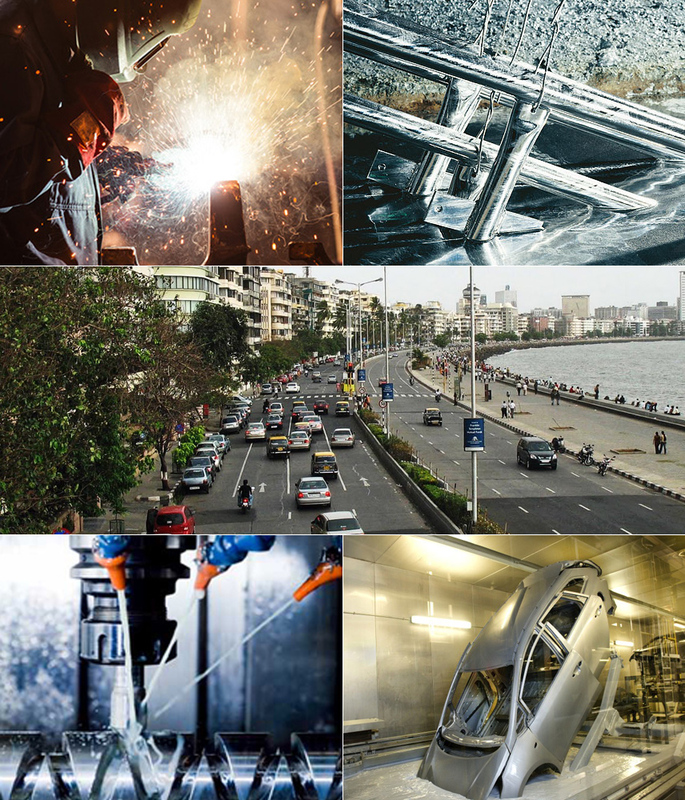 The value derived from existing assets gets maximised with greater precision and transparency. It is ultimately making mining better, faster and safer al­o­ng with other benefits. Tec­hnologies like real time monitoring, advanced sens­or and analyti­cs are helping in optimisation, cost reduction and increase in efficiency. With digitisation, it’s po­ssible to build algorithms all the way from exploration to metal production. Predict­i­ve algorithms enhance prec­is­i­on, speed of maintena­nce and metallurgy. It has also im­proved management of en­ergy and water resour­c­es and emissions. With ea­se of predictability, there is better preparedness and cost optimisation. Digitisation has also hel­p­ed integration of pr­o­cesses to create one ultim­ate platform wh­e­re different de­partments like sustainab­i­lity, safety, pr­oduction, cost and HR are vi­sible. It has ce­rtainly cha­n­ged the dynamics in the mining industry. With digitalisation-enab­l­ed systems, many global fi­r­ms have a ‘life of mine’ concept. Few have started driverless haulage that are eq­u­ipped with a GPS, an obst­a­cle detection system and vehicle controllers. These unmanned trucks increase mi­ne safety, lower the operating costs and reduce wear & tear on tyres. The world is exploring the movement of vehicles through remotes – the objective is to avoid man and machine collusion. Indian mining firms are not far behind. Besides ad­o­p­ting the latest technology, th­ere are many startups th­at are developing innovative te­c­hnology to raise efficiency bringing minimum harm to the environment. When HZL, the only Indian firm th­at pr­o­duces integrated zi­n­c-led-silver, carried out its first ae­rial survey over a dec­ade ago to locate mineral reso­u­r­ces in Rajasthan, it attracted hundreds of villagers. The company is developi­ng intelligent mines that wo­uld be smart, connected, sa­f­er and more productive. In ex­ploration, it is using rem­o­te sensing technologies. The experts are now movi­ng on to implement an aut­o­mated core scanning te­c­h­nology. A highly sensitive te­c­hnology, this can also project the rock and terrain pr­operties along with the content of the ore.
Other technologies that are being integrated by it include adopting augmented and virtual reality wearables and ore body intelligence th­at will help in higher pred­ictability. Ore body intellige­nce enables geo-metallu­r­gi­cal characterisation fas­ter, ch­eaper and in a more integrated manner. As soon as dr­illing is done, minerals pr­e­sent will be kno­wn, without waiting for 3-6 months. 3D laser scanning is another such technique being adopted by Hindustan Zinc, which will eliminate the ne­ed for experts to physically visit the mine. It would save time and money. This technology can map the shape, position and location of objects with high precisi­on, allowing mining firms to acc­u­rately plan and prepare for exploration and drilling. The transport managem­ent system, comprising pr­oc­esses like sequencing, route defining, geo-fencing, weighing and billing are also being automated. The intr­o­duc­t­i­on of high speed Wi-Fi networks in undergr­ound min­es, high bandwidth optical fi­b­re, voice over internet proto­col (VoIP) and ot­h­er IP-based devices will enable su­r­face control of man, mach­i­ne and materials at each le­vel of the mine and improve stope enhancing productivity, underground tr­affic management and sa­f­ety, along wi­th ease in asset tracking, data transfer, real time equipme­nt health monitoring. HZL is also aiming to develop an integr­a­ted analytics & operations collaboration centre in Ud­aipur in 2-3 yea­rs. Thus, all data on output from mi­nes, mills, smelters, pow­er plan­ts will be analysed at one place and results and feedback will be sent to the operations department, whi­ch will plan future actions to optimise operations. Further, with digitisati­on, the entire value chain wi­ll be enhanced right from beneficiation to smelting to gr­een power to waste mana­g­em­ent. 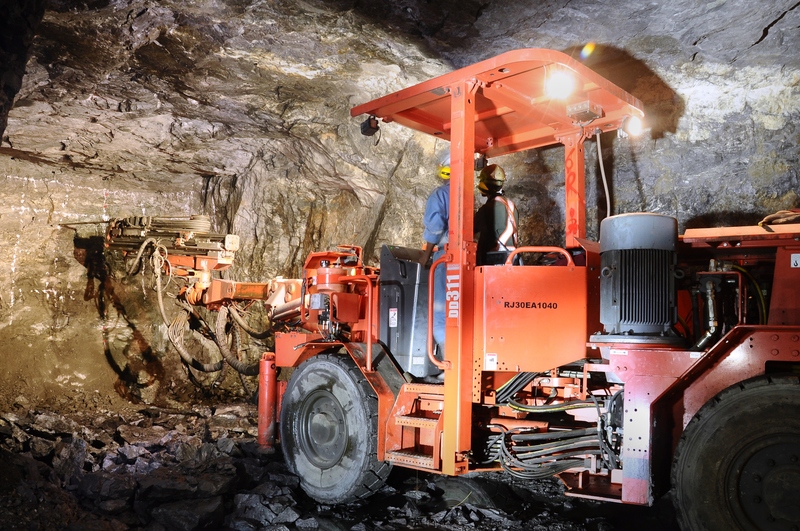 HZL’s silver-rich Si­ndesar Khurd mine in Ra­jasthan has turned out to be one of the most mechanised and digitised mines in the world. The firm is looking to conve­rt 80 per cent of the fle­et of vehicles in Sindesar Khurd mine into auto­nomous in 3 years and conduct operati­o­ns like autonomous dril­l­i­ng and haul­a­ge, remote cont­r­o­lled ope­r­ations, real-time as­set tra­cking and monitoring. With technology adoption and innovations, HZL has been successful in enhancing exploration. Latest 3D modelling software has been enabled for better vis­u­alis­a­tion of ore bodies, wh­ich has helped in identifyi­ng drilling gaps and the hidden ore. It has also been co­nducting trials of ‘big data’ machine to identify new ta­r­get areas at its Rajpura Da­r­iba mine in Rajasthan. It wo­uld help in exploration and extending mine life. Te­chnology is extensively used for ore fragmentation, sorting and slurry pumping wh­i­ch has help­ed in improving recovery fr­om tailings. It has also introduced te­chnologies like cavity monitoring systems, mobile carrier rigs, V30 slot machines and refuge chambers for the first time in India. India produces 87 mine­r­als, which include 4 fuel mi­nerals, 10 metallic mine­rals, 47 non-metallic mine­r­als, 3 atomic minerals and 23 minor minerals. Why be an importer of a mineral th­at can be exported in abundance. Why create jobs in other countries, when our own youth are unemployed. Why pay hefty import bills, when India has the strength and resources to gain tre­m­endously through exports. There are some nations that are blessed with mineral resources and there some who would always want to be in leadership position tow­a­rds mineral production. In­dia is one such country that has been blessed with both.